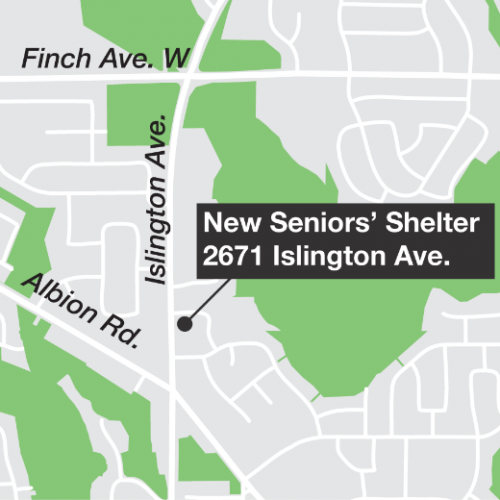 The new Islington Seniors’ Shelter at 2671 Islington Avenue is in operation with ongoing renovations planned for 2019. This new shelter will help seniors who are experiencing homelessness find and keep a permanent home. During the day, residents will receive services from case managers and housing workers tailored to their specific needs. The shelter is managed by The Salvation Army, an experienced non-profit shelter operator, who will follow the Toronto Shelter Standards. The complex will comprise of three floors plus a basement upon completion of phase two renovations in 2019. Based on the final design of the building, total occupancy is estimated to be 90 beds. Renovations of the property are planned to happen in two phases. Phase one involves the renovation of 45 units on the third floor with several offices on the first floor expected to be operational by the end of the year. Phase two involves the renovation of the first, second and basement levels. Community engagement is essential to ensure that the new shelter is a good neighbour and serves as a valuable asset. Discussion with the community focuses on how the new shelter can be best integrated and provide benefits to local residents. The public will have an opportunity to support the shelter’s success both for clients and the host community by engaging with the Community Liaison Committee (CLC). The purpose of this committee is to gather resident feedback on how to best welcome clients and optimize operations of the facility. This committee will work directly with The Salvation Army’s Community and Client Engagement Coordinator. Meetings will continue for up to six months (or longer if necessary) following the opening of the shelter. The first CLC meeting will occur on February 4, 2019 from 7:00 p.m. to 9 p.m.
To learn more about the CLC, please email Krystina_Damyanovich@can.salvationarmy.org. Based on the preliminary assessment of the property, potential benefits may include: space on the first floor and/or basement for community uses (i.e. for faith-based events, meetings, etc. ); landscaping elements and green space. Volunteering opportunities may be available through The Salvation Army.